Billionaire Bill Gates says he’s trying to prevent an apocalyptic nightmare – one which he says could kill 30 million people in 200 days. He says the scariest recurring nightmare is a global pandemic, triggered by a bio-terror attack, and he’s trying to reach out to new National Security Adviser John Bolton about a vaccination plan he believes can prevent it. But not any vaccine is 100% effective, and some are straight up death traps; a game of Russian roulette if you will. But to billionaires like Gates, our lives and health don’t really matter at all. He has the means to survive, so he isn’t concerned about what we inject in our bodies – pandemic or not. It’s quite obvious he’s on a fear-mongering propaganda campaign for vaccine manufacturers. In fact, Gates made a presentation on his fears last week to the Massachusetts Medical Society. The Microsoft co-founder now leads a foundation on global health and he said he briefed President Donald Trump, who encouraged him to follow up with top officials at the Health and Human Services Department, the National Institutes of Health, and the Food and Drug Administration. 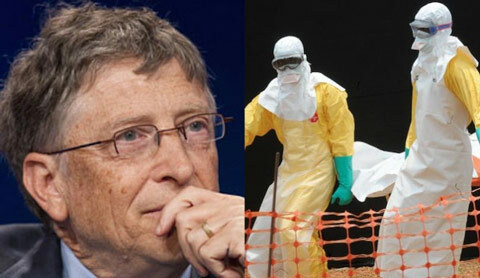 Gates believes that like the last major pandemic one that occurred 100 years ago in 1918 and saw the influenza virus kill as many as 100 million worldwide, another is right around the corner. Gates says only the U.S. has the resources to prevent it, though it will require an organized global plan – one that currently does not exist. And what he wants, is a massive forced vaccination campaign. Vaccines alone are sometimes bigger killers than the diseases they allegedly prevent. Measles has killed one person in 2015, and before that, one died in 2003. So two measles deaths have occurred since 2003 from the actual infection, but the vaccine has killed 445. But Gates doesn’t care what you want and what the numbers say, he wants everyone vaccinated. And if he’s got to play on fear to get it, he’s going to: it’s king the MO of globalists. Gates believes that if a highly contagious and lethal airborne pathogen like the 1918 influenza were to take hold today, nearly 33 million people worldwide would die in just six months, Gates noted in his prepared remarks, citing a simulation done by the Institute for Disease Modeling, a research organization in Bellevue, Washington. Besides a massive vaccine push, Gates has other ideas about preparing for the worst. “So, we need to invest in other approaches, like antiviral drugs and antibody therapies that can be stockpiled or rapidly manufactured to stop the spread of pandemic diseases or treat people who have been exposed,” he said in his speech. Of course, Gates’ nightmare is not even a worst-case scenario. Another leading flu expert says the next one could easily wipe out 300 million worldwide. What about boosting immunities naturally in preparation for a pandemic? Gates seems to think the best way is to spend money on government approved vaccines or drugs. At the end of the day, we should all be free to make our own decisions about whether or not we want to be injected with vaccines. It’s easy to see the government is pushing them on us, but that just makes some even warier.